Although fermentation is vital to the wine-making process, it is also what causes an unpleasant odor when wine is spilled on carpeting. If lingering wine odor remains on your carpet, it's likely the spilled wine wasn't completely removed. Complete removal and deodorization gets rid of the fermented odor in the carpet fibers. 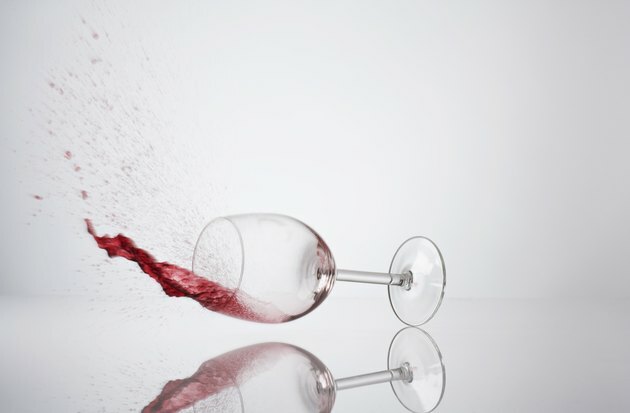 Wine spilled on carpet can leave a lingering, sour odor. Pour 2 cups of warm water into a bowl. Add 1 tbsp. of dish detergent and 1 tbsp. of white vinegar. Wet a cotton cloth with the vinegar and detergent mixture. Squeeze the cloth to remove excess moisture. Sponge the area of the carpet that still smells like wine. Moisten the carpet fibers down to the bottom of the carpet to loosen any remaining wine stains. The vinegar in the solution will act as a deodorizer to help remove the smell. Press a dry cloth into the carpet to absorb the detergent solution and loosened wine stain. Rinse the carpet with a damp cloth to remove the soap solution. Absorb moisture with a dry cloth, then allow the carpeting to air-dry the rest of the way. Sprinkle baking soda on the carpet to absorb any remaining odor. Leave the baking soda on the carpet overnight, then vacuum it up the next morning.